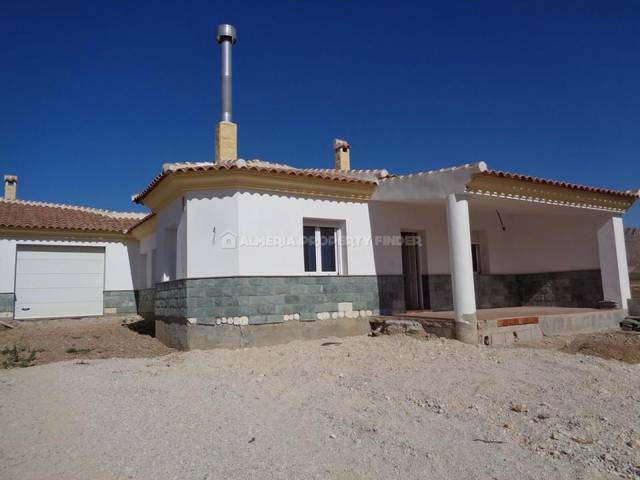 Three bedroom L-shaped villa for sale in Chirivel, set in a walled and gated corner plot, with stunning mountain views. Vehicle and pedestrian gates open into a front garden laid with gravel and planted with mature trees and shrubs. The glazed front door opens into a hallway, on the left is a double bedroom with fitted wardrobes and en-suite shower room, down the hallway is the large lounge/diner with feature fireplace and built in fan assisted wood burner. Patio doors from the lounge open into a sun lounge with enough room for both dining and relaxing, doors from here give access to the garden and to the rest of the villa. The modern kitchen is located off the entrance hallway and is fully fitted with beech units, granite worktops, a ceramic hob, built in oven, washing machine, dishwasher and double sink. A feature arched opening visually links the kitchen with the lounge/diner. Also off the hallway is the corridor that leads to the two further bedrooms and the family bathroom. Both bedrooms are good sized twin rooms with fitted wardrobes and the bathroom has a full-size bath with shower over, WC and basin. The rear garden is a pleasant private sheltered area planted with a mixture of fruit trees, including cherry, pear, apple and plum. There is also a good sized garage, with lighting, power points and shelving, plus a wood store. The property benefits from ducted hot and cold air conditioning throughout, and there are wall mounted electric radiators in all rooms. All the mains services are connected, as is satellite TV and the internet. The vendor was previously given permission to install a pool but decided not to go ahead. Whilst this permission has expired, the Town Hall have advised there will not be a problem in updating the licence. The villa is on the edge of a small village, within 7 minutes drive of the market town of Chirivel and 15 minutes to the larger town of Velez Rubio. A small petting zoo is within a couple of minutes walk and the views at the front and rear of the house are outstanding.